The Administrative and Finance Committee under the overall control of the Governing Body oversees the funds and annual budget of the Institute. The Committee prepares the Annual Budget and examines the Annual Statement of Accounts for the approval of the Governing Body. The annual budgetary requirement of the Institute is primarily met by the grant-in-aids from the ICSSR and the Government of Assam. 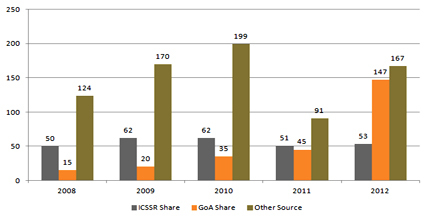 It is mandated that both the ICSSR and Government of Assam share the annual budgetary requirement equally. However, this mandate is seldom fulfilled. Besides, the Institute receives project based funding from both Indian and foreign agencies. Apart from the annual grants in aids from the ICSSR and the Government of Assam, as well as project specific funds, the Institute has received a couple of endowment grants. The first endowment grant worth rupees one crore from the Planning Commission of India supports the research. The Ford Foundation has granted the second endowment grant worth two hundred and fifty thousand dollars for supporting the Peace Studies Programme of the Institute. Over the years, the Institute has substantially grown financially in terms of annual turn over. This impressive financial performance is reflective of the proliferated activities of the Institute. The finances of the Institute are annually audited by certified chartered accountants dully appointed by the Governing Body and the approved Statements of Accounts are submitted both to the ICSSR and the Government of Assam. Moreover, the Comptroller and Auditor General (CAG) conducts regular audit of the accounts of the Institute.